"LIKEWISE, in order that care be taken of the building, of the revenue, and of those admitted into the hospital, I ORDAIN, that on the same day on which the deacon-convener is chosen, a director, or master and caretaker of the hospital be chosen by the said minister of the Word, deacon-convener, and other deacons—a man, diligent, pious, and able to exercise that office, and who shall yearly give an account of his diligence, care, and faithful administration to the foresaid minister of the `Ford of God, deacon-convener, and other deacons of the crafts, in the week preceding the new election of the deacon-convener or deacons. "I WILL also, that no woman dwell in the said hospital (although the wife of one that is admitted), or stay therein for a moment ; and that no one who is admitted wander in any way forth thereof through the town or streets; and that they all be always clothed with gowns of a single and decent colour ; MOREOVER, that the said beadmen be subject and obedient to the commands and admonitions of the foresaid director, and that they be an honest, godly, and peaceable conversation. And if any of them wander without, or be troublesome within to any of their comrades, or commit any other fault, or be found disobedient, or a breaker of the rules of this mortification, he shall be punished in his person, or removed from the hospital, by the said director, who, however, in this case shall take the advice and consent of the foresaid minister of the Word of God and deacon-convener, who have, and by these presents shall have power, one poor man dying or removing from the said hospital or being otherwise withdrawn, to choose and put in another poor man in his place, in form aforesaid. "I WILL also, that they be always present at the Sunday and weekly sermons (unless they be confined to their beds by sickness), as also at the public morning and evening prayers (especially in summer). ALSO, I ordain that in their own chapel a portion of the Word of God be read twice daily, and prayers offered up by a suitable reader (who shall have fifty merks paid him therefor yearly), to be properly chosen by the patron, which service shall be between nine and ten in the morning or forenoon, and between three and four in the evening or afternoon : and whoever (except through sickness) shall be once absent, let him be admonished; if twice, punished by the director ; and if thrice, removed from the hospital. "I WILL also, that one of the foresaid poor men be janitor of the said hospital weekly, having the keys of the doors and gates thereof (except the keys of the private rooms) ; and keep this order—First, in the morning, he shall open the outer gate and the door of the house and chapel at half-past seven hours, that they may go to public prayers in the church, or to hear a discourse, and at that same hour shall ring the bell a little, that by ringing thereof the rest being awakened may make themselves ready for the foresaid exercises: Next, the same janitor shall ring the bell regularly about the ninth hour in the morning, and the third hour in the evening, to summon the rest to hear prayers and the reading of the Scriptures in the chapel : And from thence they are to go to their own private rooms, and use their trade till the eleventh hour in the forenoon, and the sixth in the evening, and then they shall assemble in the common hall, and under a common president dine and sup together, the hebdomadar always publicly giving thanks. "TO BE HELD AND HAD the foresaid place, with all and sundry its houses, church, yards, and pertinents whatsoever, as also the lands, annual rents, fruits, profits, and emoluments whatsoever, pertaining to that monastery, wheresoever [they lie], and mortified by me; from me and my heirs, by the said poor and their successors who shall be put into the said hospital, of our Lord the King and his successors; in pure and perpetual alms and mortmain for ever: with full power, faculty, and authority, to the said poor, by their director and caretaker of the, hospital aforesaid, to exact, crave, uplift, and receive the annual rents from the persons due therefor, and, on failure of payment, to compel them by the common law, and to do, use, and exercise, all and sundry other things which shall be needful or convenient for obtaining receipt and payment. "RENDERING therefor yearly and daily, the said poor, and their successors dwelling in the said hospital, to our Lord the King and his successors, as also to the burgh of Aberdeen, and to the magistrates, ministers, and other inhabitants thereof, the offerings of devout petitions. "RESERVING to us, during all the time of our life, the power of the patronage and direction in all things, as shall seem to us most expedient therein. "IN WITNESS WHEREOF, to this my charter, written and subscribed with my hand, my authentic seal is appended, at Aberdeen, the sixth day of the month of June, in the year of our Lord, one thousand six hundred and thirty-three, before these witnesses, Mr. Thomas Melvill, Minister of the Word of God at Dyce; Mr. Walter Anderson, Minister at Kinellar; and Mr. William Ogstone, Minister at Kinnethmont." WHICH CHARTER above-written, donation and mortification therein contained, in all its points and articles, its conditions and forms and circumstances whatsoever, in all and by all, in like form and effect as aforesaid, we ratify, approve, and, for us and our successors, for ever confirm. FURTHER, with express consent and assent aforesaid, for the great regard which we have for the glory of God, and the help and support of the said poor, of our own certain knowledge and free will, we have OF NEW given, granted, founded, gifted, mortified, disponed, and by this our present charter have confirmed, and by the tenor thereof do give, grant, found, gift, mortify, dispone, and for us and our successors for ever do confirm : All and whole the foresaid place and monastery of the brethren of Holy Trinity of the said burgh, with all and sundry the houses and buildings thereof, together with the said church, churchyard, yards, orchards, greens, and pertinents whatsoever, lying as aforesaid ; as also the ministry of the said place, with all and sundry lands, annual rents, fruits, profits, emoluments, and duties whatsoever, now belonging, or which were of old known to belong thereto, as well within the burgh, as in the fields without the burgh, with the tenants, tenandries, services of free tenants of the same, with all their pertinents, with all right, title, interest, and claim of right, property and possession as well petitory as possessory, which we, our predecessors or successors, had, have, or in any way may claim or pretend to have thereto, or to any part or portion thereof, or to the mauls, fermes, profits, and duties of the same, for any years whatsoever bygone or to come, by reason of ward, relief, non-entry, escheat, forfeiture, recognition, purpresture, disclamation, bastardy, reduction of infeftments sasines or retours, revocations, or Acts of Parliament whatsoever, or by other laws, practices, or constitutions, of this kingdom; renouncing and upgiving the same, with all action and instance thereanent, for us and our successors, now and for ever, with the paction of not seeking, and with supplement of all other defects, as well not named as named, which we, for us and our aforesaids, will to hold as set forth at length in this our present charter: TO BE HELD AND HAD of us and our successors, in pure and perpetual alms and mortmain for ever: RENDERING therefor yearly and daily, the said poor, and their successors dwelling in the said hospital, to us and our successors, and to the said burgh of Aberdeen, and to the magistrates thereof, the ministers, and other inhabitants of the said burgh, the offerings and prayers of devout petitions. 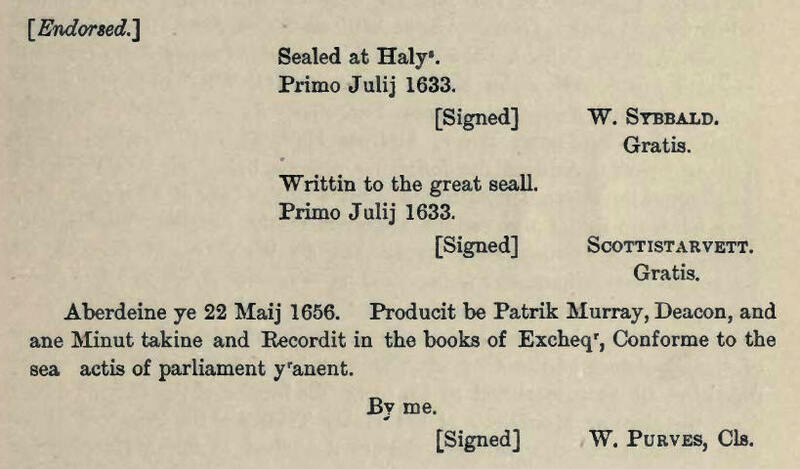 IN WITNESS WHEREOF, to this our present charter we have ordained our great seal to be appended.—WITNESSES, our well-beloved cousins and councillors, James Marquis of Hamilton, Earl of Arran and Cambridge, Lord Aven and Innerdale, &c. ; George Earl of Kinnoul, Vicount Dupplin, Lord Hay of Kinfauns, High Chancellor of our foresaid kingdom of Scotland ; William Earl Marischal, Lord Keith and Altrie, Marshall of our said kingdom; Thomas Earl of Haddington, Lord Binning and Byres, Keeper of our privy seal; William Viscount Stirling, Lord Alexander of Tullybrodie, our Chief Secretary ; our beloved familiar councillors, Sir John Hay of Laud, Clerk of our rolls, register, and council; Sir George Elphinstone of Blythswood, our Justice Clerk; and Sir John Scott of Scottistarvett, Director of our chancery, knights. At Holyrood House, the twenty-fourth day of the month of June, in the year of our Lord, one thousand six hundred and thirty-three, and of our reign the third.